Directions: Take turns reading aloud the excerpt from the speech made by Chief Denson. Highlight or underline those words and phrases which in your opinion are positive and interpret their meaning in your own words. Prepare a brief description of your culture using as many of the words and phrases you highlighted in Question 1 as you can. 1. The Choctaw are a proud people with an arduous history. Like their neighbors the Cherokee, the Choctaw were forced to move from their land. Theirs is also a history of intrigue and glory. One reason is that their forefathers played an important role during World War I in this country! In the following pages you’ll learn the meanings of: Code talkers, head flattening, and the Green Corn festival. 2. The antecedents of the Choctaw people were part of a very large group of Indians which inhabited the southern and middle Mississippi valley region as much as 4,000-8,000 years ago. Several Spanish expeditions in the early 1500′s might have contacted the Choctaw, but there is no question that Hernando De Soto’s 1540 expedition encountered them: The Choctaw inflicted a significant loss on De Soto’s men in a battle near present-day Mobile, Alabama in 1541, and De Soto’s expedition never recovered from the violent confrontation. 3. As with all of the other American Indian tribes, the Choctaw had always had conflicts with the various neighbors, most notably the Chickasaw. But the coming of the Europeans greatly intensified the wars and battles. 4. Beginning about 1700, both British and French traders vied for trade relations with the tribes, with the Choctaw ending up allied with the French, and the Chickasaw allied with the British. Besides direct conflicts between the British and French (due to their European wars), the traders stirred up many additional wars between the Choctaw and the Chickasaw tribe. The traders also caused conflict between the Choctaw and the Creeks. 5. When the French and Indian War ended in 1763, the Treaty of Paris removed the French from east of the Mississippi River, and the Choctaw became part of Britain’s empire. During the American Revolution, some Choctaw fought for the colonists under Washington and other generals, while other Choctaw fought on the side of the British. 6. Following the American Revolution in 1783, the Choctaw signed the Treaty of Hopewell with the new United States, placing the tribe under the protection of the new government. However, pressure from the white settlers steadily increased, and by 1800, the Choctaw were beginning to cede some of their lands. 7. In 1811, the noted Shawnee chief Tecumseh was attempting to establish an Indian Confederacy to resist further encroachment. He asked the Choctaw to become part of the confederacy, but the Choctaw chose not to join him and attempted to live in harmony with the U.S. Yet throughout this time, pressure on the Choctaw to leave their traditional grounds steadily increased. 8. In 1830, then-President Andrew Jackson forced the Choctaw to be the first tribe to be removed from their homelands and relocated in Oklahoma. Almost 15,000 traveled, while about 5,000 remained behind in Mississippi. Many died along the path, victims of disease, exposure, and malnutrition. 9. The newly removed Choctaw tribe set about building new lives in Oklahoma, establishing schools and churches, drafting written laws and a constitution, and taking on many of the white settler’s ways. 10. During the American Civil War (1861-1865), most of the Choctaw sided with the Confederacy and several Choctaw battalions were raised, though none saw extensive battle. During World War I (1914-1918) many Choctaw fought, and 14 Choctaw men became Indian “code talkers”, using their language for military communications, which could not be deciphered by the German enemy. Locate each of the following words in bold in the story; the numbers in parenthesis indicate the paragraphs where the words can be found. Next, try to infer the meanings from the context. Use a dictionary to check your answers. Add and highlight any other new words that you may find. With your group, create sentences using the vocabulary words. Directions: Read each of the following statements concerning the reading and decide if it is true(T) or false (F). If the statement is false, correct it. In each case, locate the appropriate part in the reading to confirm your answer. 1. The progenitors of the Choctaw lived 4,000-8,000 years ago. 2. The Choctaw won the battle against DeSoto and his men. 3. The battle occurred near what is today known as Georgia. 4. De Soto recovered from the battle. 5. The Choctaws never had conflicts with other tribes until the Europeans arrived. 6. After the French and Indian War ended, the Choctaw remained allies with the French. 7. During the American Revolution, some Choctaws fought on the side of the Americans, while others fought on the side of the British. 8. The British won the Revolutionary War. 9. As more white settlers moved into their territory, the more the Choctaws fought. 10. The Shawnee Chief Tecumseh wanted the Choctaw to join his fight against the whites. 11. In 1830, President Andrew Jackson allowed the Choctaw to remain on their land with his blessings. 12. During the Civil War, 14 Choctaw men became code talkers for the U.S. military. 1. Although the colonists were steadily moving into their territory, the Choctaw refused to join Tecumseh and the Indian Confederation. Discuss the possible reasons for their refusal. 2. The Choctaw wanted to live “in harmony” with the white settlers. Discuss your reasons for why this arrangement would have or would not have been possible. 3. Discuss the possible reasons why the Choctaw battled the Chickasaw and the Creek Indians. 4. If the Choctaw had joined The Indian Confederation proposed by Tecumseh, would the situation between the white settlers and the tribes have been different? 5. After all of the maltreatment from the U.S., 14 men from the Choctaw tribe became code talkers for the U.S. military during World War I. Why? Choose a topic from the following list and prepare a presentation for class or for group discussion. Directions: Choose one of the following writing activities. Reread the history of the Choctaw and create a time line for them from 1500-1918. Select an event from the Choctaw history and write an essay in which you describe the event in detail. Once upon a time there were two Choctaws camped out under a summer moon when they heard a beautiful but sad sound. They walked along the river’s edge following the sound until they came upon a woman standing on a mound of earth. She was very beautiful, surrounded by light, and wore a dress of white decorated with delicate flowers. Now these two Choctaws had very good manners so they asked her right away how they could help her. “I am hungry,” she said with a small sad voice. The men did not have much food but they gave her their entire supper, and they gave it to her happily. The lovely lady ate only a little and thanked them with a promise. “If you will go and tell no one you saw me, I will ask my father, the Great Spirit, to give you a great and wondrous gift. Return to this exact spot at the next moon.” A little breeze suddenly blew by and she was gone. The Choctaws returned to their families and said nothing, even though they wanted to. At the next moon, they quickly returned to the spot but were saddened to see that the woman was not there. But on the exact spot where she stood was a tall green plant with leaves that looked like the swords of the white men. The food this plant gave could be eaten in many different ways, all of which were delicious. The children liked the popcorn it gave best. That plant was the corn plant, of course, a great gift, indeed. Directions: Circle the meaning closest to that of the boldfaced word from the reading. Use the context of the sentences to help you figure out the meaning of each word. 1. Until they came upon a woman standing on a mound of earth. 2. She was very beautiful, surrounded by light. 3. She wore a dress of white decorated with delicate flowers. 4. The children liked the popcorn it gave best. 5. The lovely lady ate only a little and thanked them with a promise. 6. I will ask my father, the Great Spirit, to give you a great and wondrous gift. 7. The food this plant gave could be eaten. All of which were delicious. Is there a moral to this myth? If so explain it. If there a similar myth in your culture, share it with your group. In a group, create a myth that explains how something came to be. Write a paragraph in which you explain the reason why the Choctaw created a myth about corn. With the members of your group compose a myth about how another source of food was created. 1. The Choctaw men were hunters using bows and arrows which they made themselves to hunt deer, wild turkey, rabbit, and other small game animals. In addition to hunting, they were also expert fishermen. They used dugout canoes, which were fashioned from hollowed-out logs by the men. The Choctaw used other handmade tools such as nets and fishing spears. Choctaw women were responsible for the farming. They planted and harvested corn, beans, squash and sunflowers. 2. At first, the men and the women wore clothing made from the skins of the animals they hunted. After meeting the Europeans, they adapted clothing such as full skirts, shirts and cloth jackets. Everyone wore moccasins. 3. The Choctaws were known especially for their beautiful river cane baskets and wonderful woodcarvings. However, when they were forced to move from their homes to Oklahoma, the materials that they once used for their traditional crafts were no longer available. To compensate they switched to making beads, creating beadwork belts and similar items. 4. The Choctaws lived in small villages. Their houses were made from mud plaster and rivercane, with thatched roofs. The men enjoyed sports, so they also allocated space in a field for the game of stickball, including wooden benches for spectators. 5. Within the family, women took care of the home and family members, while the men had the responsibility of protecting their homes against intruders. One interesting note is that before a battle the men painted their faces and bodies with bright colors. Some also had tattoos on their arms and legs. The practices of body painting and tattooing were also executed in preparation for festivals and for certain ceremonies. During these occasions, Choctaw women also painted their faces, but they didn’t paint themselves to the extent that the men did. 6. The political system of the Choctaw was relatively simple. There was the family unit, with the father as head. There were several clans, and every family belonged to a particular clan. Each clan was comprised of many families with a leader. For important issues the clans leaders would meet and in this way decisions were made for the entire tribe. 7. In their religion the Choctaw believed in a deity and had many names for him. One of the popular names was Hashi Ikba, which means “Sun Father”. The Choctaw observed many practices; one was called head flattening, which involved attaching a board to the heads of male infants in order to flatten them. This was a common custom among the southeast Indians. The exact reason behind this practice is not clear. 8. One of the most religious ceremonies was the Green Corn Festival. This festival was both a time of thanksgiving and self-purification. The ceremony took place during the summer. In preparation for the celebration the men would clean all of the public areas, and the women cleaned their homes. First, there was a feast to give thanks for the produce and food from the last year. This was followed by a two-day fast, during which time crimes and social conflicts were discussed with the purpose of allowing them to be forgiven. Finally, there was a fire ritual where all fires were extinguished, the tribe had a moment of silence, and then the religious leader would light a fire that symbolized the beginning of a new year. 1. Although there have been many changes within the culture of the Choctaw, the people work diligently to maintain many of their traditions. 2. The men still hunt but only at specified times, and the women still cook many of the dishes that the Choctaw have enjoyed for generations such as fry bread and hominy. Today there are many grocery stores and supermarkets. 3. Choctaw women still sew and make clothing, although much of the clothes are bought from stores. Many Choctaw wear still wear moccasins, and during religious ceremonies and festivals the people will wear their traditional regalia. 4. The art of basket weaving, and bead work are still practiced. There are centers where children attend sessions to learn how to weave, make baskets and do the beadwork of their ancestors. In addition to this, many of the cultural dances are still taught. 5. The Choctaw live in regular homes and in apartments on tribal land. 6. Within the family both men and women are equal partners. Women still take care of their homes, and many have jobs outside of the home. 7. The Choctaw have a stable but complex Tribal government. The Tribal governmental structure has been in place since 1945. In that year, a Tribal constitution was ratified, and a representative, democratic form of government was established, with equal representation among all Choctaw communities. The government is headed by an elected Tribal Chief, who serves four-year terms. The current leader of the largest group, located in Mississippi, is Chief Beasley Denson. There are several existing communities within the government, including one that exists in Oklahoma. The Tribe also elects a seventeen-member Tribal Council, with those officials serving four-year terms. 8. Today the people are engaged in many thriving business enterprises, including a casino. They also boast a large and successful education system. Women are granted the same positions as men in the work force. 9. High-tech industry located on the Reservation includes Choctaw Geo-Imaging Enterprise and joint projects with the National Aeronautics and Space Administration. These are just a few examples of the successful business enterprises in which the Tribe is involved. The tribe continues to grow and flourish. 10. The religious practices of the Choctaw today are complex. Many still celebrate traditional occasions, which include the annual Choctaw Indian Fair that is held each July on the Choctaw Indian Reservation. Spring festivals are also held in each of the Choctaw communities. Thanksgiving brings the annual Choctaw Thanksgiving Feast. All of these events give Tribal members an opportunity to gather as a Choctaw community and celebrate the Tribe’s way of life, including all Choctaw traditions. Directions: Read each of the following statements concerning the reading and decide if it is true, false, or not applicable (NA). Sometimes information may be true but not reported in the reading, in which case the question would not be applicable. If the statement is false, correct it. In each case, locate the appropriate part in the reading to confirm your answer. The Choctaw used horses for transportation. European mode of dress was adapted by the Choctaw. After their relocation the Choctaw continued making their traditional baskets. They began creating bead work belts. Before a battle men tattooed symbols of war on their arms and legs. Women also painted their faces sometimes. Important tribal decisions were made by the Shaman. The women flattened an infants head to make room in his cradle. The Green Corn Festival was the time for thankfulness and self-purification. Today, the Choctaw men still use bows and arrows to hunts. Much of the clothing worn by the women today is sewn by hand. Basket weaving and bead work are taught to children. The Choctaw wear their regalia for special occasions only. The Choctaw women are treated as equals to men in the workforce. Provide possible reasons for the men painting and tattooing their faces and bodies before a battle. What could have been the significance of having the heads of male infants flattened? What made the Choctaw adapt European style of dress? Code talking began in the United States during World War I. The American Military used the complex American Indian languages as code, to keep the German forces from intercepting and decoding American military information. “Captain Lawrence, commander of one of the companies, was strolling through the company area when he happened to overhear Solomon Lewis and Mitchell Bobb conversing in their native Choctaw language. However the story began, it is fact that the Choctaw were the first tribe to be recognized as “code talkers”. There are eight men who were given credit as being part of the original group of Choctaws instrumental in helping the American Military Force win significant key battles, as “code talkers’. All were born in the Choctaw Nation. Unfortunately, there was little mention of the Choctaw Code Talkers after W W I mainly because the men did not discuss their roles during war. Both the term, and the Choctaw association to the term died out. It resurfaced again during World War II, when Navajo speakers were recruited especially by the Marines to serve in their standard communications units located in the Pacific. Today the term code talkers is strongly associated to the Navajo, especially in “Hollywood” movies. One reason given for this is that because the Navajos had a history of fighting wars against the United States, they served as a more “lively” topic for “make-believe” films. This was in contrast to the quiet, organized, agrarian Choctaws, who adapted the American way of government for their own tribal affairs, including the basics of the U.S. Constitution. 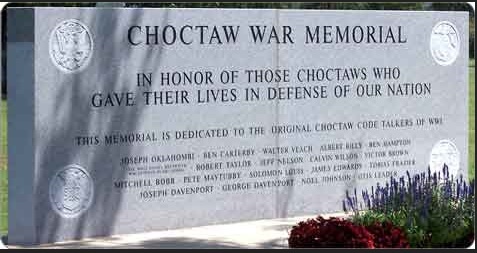 In addition to the eight men mentioned, there were other Choctaw soldiers who contributed their efforts during the war, and their names were placed on the Choctaw War Memorial which was erected in 1995 at the Choctaw Capitol Building in Tuskahoma, Oklahoma. It includes a huge section of granite dedicated to the Choctaw Code Talkers. Other American Indian Code Talkers for the United States Army during World War II, were the Cherokee, Lakota, Comanche, and Meskwaki soldiers. 1. In what country did “code talking” begin? 2. During what major event did code talking begin? 3. Which language was first used for code talking? 4. Why was it necessary to transmit messages in code? 5. 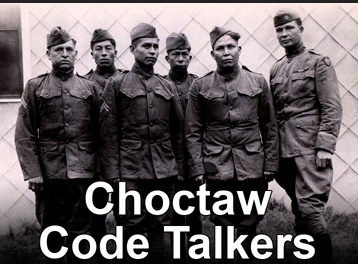 Why didn’t the Choctaws receive credit as being the first code talkers during WWI? 6. In films today, which tribe is noted as being code talkers? 7. Have the Choctaw Code Talkers been honored ? Where? The primary goal of the content of this reading material is to raise students’ awareness of the American Indian people living in the United States today, and to view them as an integral part of American society. My hope is that students will see the Native People of this country as professional workers, students,, parents, and leaders of their communities. The construction of the exercises makes the reading material more of a communicative activity, and help students better understand the content. There are various pre-reading, while-reading and post-reading tasks for each reading selection. Although the majority of the exercises are suggested for group work, especially during class, students can complete the activities independently as homework assignments. At the following class meeting, their responses can be used as the basis for group discussions. The research activities can also be completed individually or as collaborative group projects. I offer some suggestions for some of the activities throughout the lesson. The target language skills for the lessons are primarily reading and speaking, however, tasks for writing, and research activities are also included. These exercises are intended for ESL students, but everyone can use them. Although the reading level is high-intermediate to advanced, teachers can modify the material as needed for their level of learners. 1. Positive words and phrases: triumph– strong Choctaw heritage– renaissance of Choctaw cultural arts– educational achievements– progressive economic– development– strong inner spirit has sustained us– beautiful and creative ways– outwardly towards others. The Choctaw were tired of fighting. Maybe they felt it was useless to fight because the white settlers continued to enter their lands. The settlers outnumbered the Indians and they continued to enter the country in vast numbers, trying to live in peace with the settlers would have been possible, as long as the white settlers didn’t encroach on too much of the Choctaw’s land. Power for land, personal vendettas, racial or cultural conflicts. Maybe, there would have been a larger number of Indians, and maybe they would have had a better chance to overpower the settlers. Perhaps at that point in time the Choctaw felt that helping the country of their birth win the war was important. Is there a moral to this myth? “ Be kind to people because you never know to whom you’re speaking”. Men painted themselves to appear more fierce to their opponents or for religious purposes. A flat head might have signified great intelligence, or wealth. The Choctaw felt that the European dress was pretty, or they wanted to be part of the culture that was becoming dominant. 2. During World War I. 4. It was necessary so that the Germans couldn’t decode the U.S.military massages. 5. The Choctaws did not talk to other people about their part in the war. 6. The Navajos are noted as being the first code talkers. 7. Yes. There is a monument located in the Choctaw Capitol.